I have been fortunate to experience many races. I grew up as a swimmer and runner, so most weekends involved some sort of competition. They bring an energy that can be fulfilling and addicting. Now that I am an adult, the events have shifted from an extracurricular activity to one that includes a variety of race types throughout the world. 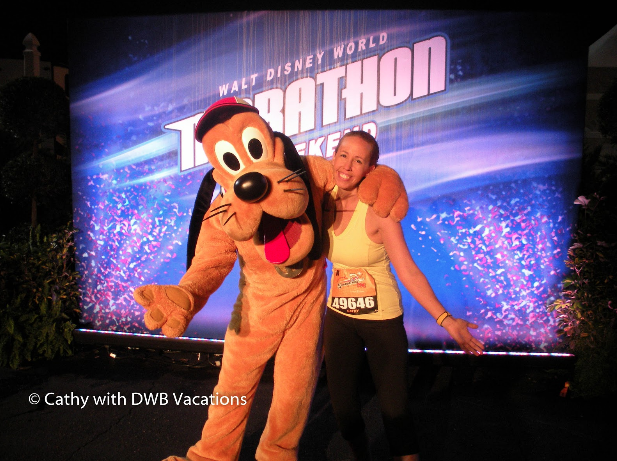 Just to give an idea of some of the races, there is the Disney World Marathon, the Tinkerbell Half Marathon, Triathlons in San Diego and an open water swim in Hawaii. There are Rock ‘n’ Roll Marathons and Half Marathons in cities across the globe. There are races even in locations you wouldn’t expect, like Disney’s Castaway Cay Island in the Bahamas. 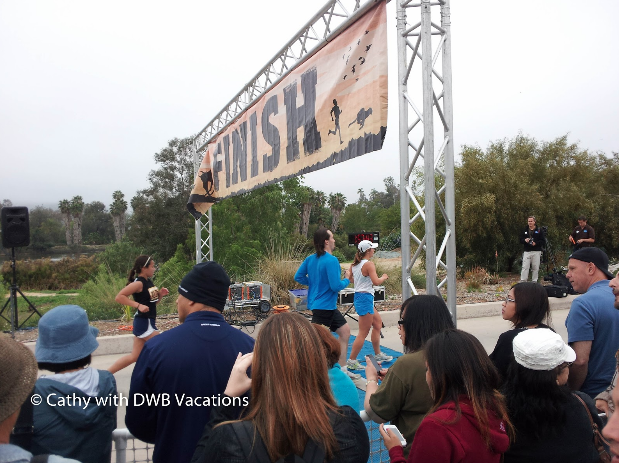 Participating in races can require travel, which can be both rewarding and cumbersome. Unlike a local 5k, there are many aspects to consider. Some things to think about are how to get there, where to stay and what equipment will be needed for the race. While there are races that involve just a pair of running shoes and comfortable attire, others require much more. Triathlons are extremely popular, but require a bike. There is the option of renting a bike in the city of your race or taking your bike with you. Many airlines have specific rules, requirements and fees for bikes. One requirement that most airlines require is for your bike to be in a special box or case. Another factor to consider is that once you get to your destination you might find your hotel room so small that you are climbing over the bike for your entire stay. Open water swims require participants to have spotters to keep an eye out for problems such as other boats. It can be tough enough to find someone that can spot for you, but now you need to make sure they can get there in order for you to participate. Races tend to have early start times, and a road closure or other setback can make things more complicated. I have seen many people in a sprint while approaching the starting line. I can’t imagine being out of breath before the race has even started. 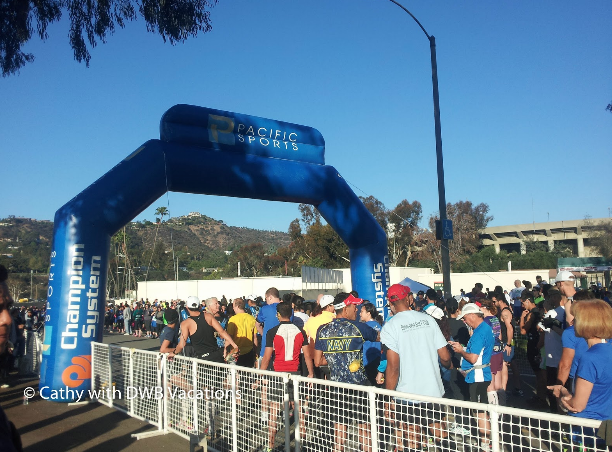 Selecting a hotel close in proximity to the starting line can help decrease the stress of trying to get to your race. Not all of the planning is tedious, but that doesn’t make it less time consuming. Traveling for a race allows for a person to experience and see new places. Since a portion of your trip will be occupied with the race and recovery, you will want to make sure you optimize the rest of your time in your destination. 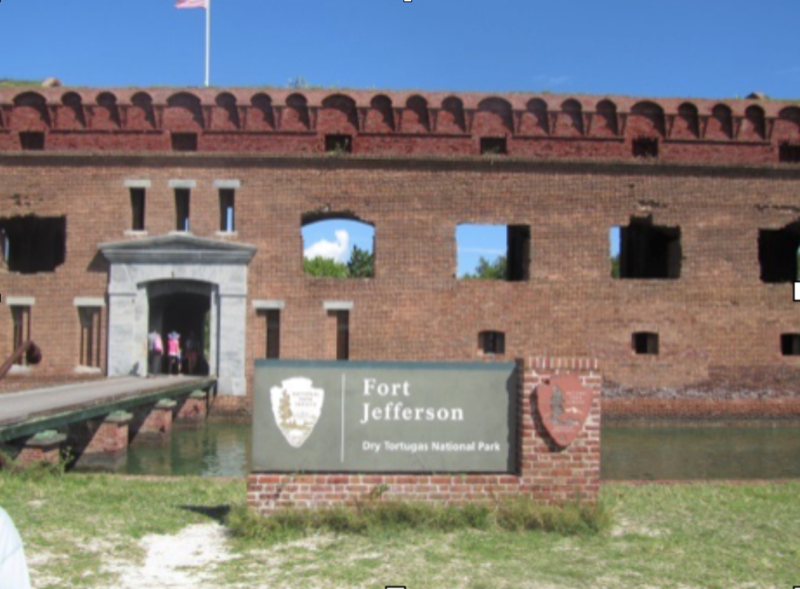 It can be time consuming to figure out the must see and do locations for your free time. You could spend time away from training, doing research on the travel options, or you could reach out to your trusted Travel Planner. Do yourself a favor, and once you register for one of the unique races, let someone else work on the travel portion for you. You have enough to think about as you try to increase your speed or simply train. Thrills are multiplyin’. Slick back your hair and pack your poodle skirts. 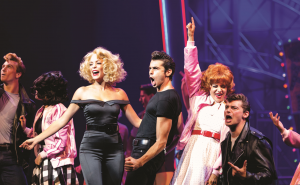 The Broadway hit Grease, The Musical is coming to the high seas for the first time ever. 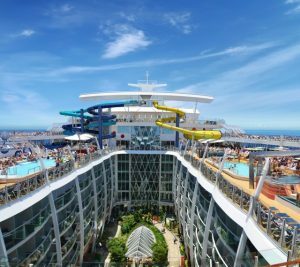 Experience it only on Royal Caribbean’s newest ship, Harmony of the Seas. Royal Caribbean Cruise Line is known for bringing Broadway To Sea with other hits like Hairspray, Cats, Mamma Mia! and more! Grease can only be seen on Harmony of the Seas and Independence of the Seas. 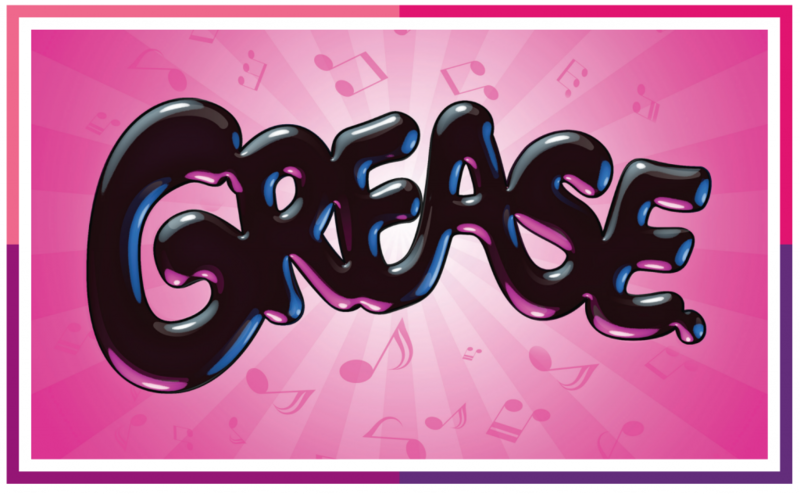 The cast of Grease is very excited! Enjoy this fun introduction to their rehearsal facility and meet the cast! If you would like to learn more about any of the great adventures you can take on a Royal Caribbean cruise, please contact your favorite DWB Vacations planner today! 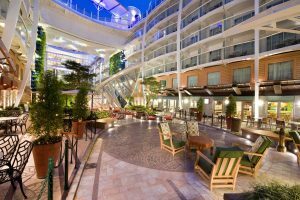 Royal Caribbean’s Harmony of the Seas, part of the Oasis class of ships, is huge but with 7 neighborhoods on board Royal Caribbean Cruise Line’s Harmony of the Seas, everyone is certain to find their favorite area to relax and enjoy their time on this amazing ship! Each distinct area helps cruisers feel like they are in a smaller, more intimate area. What is in each neighborhood? Caribbean Cruise Line did! Central Park is a lush, relaxing area with tropical area, trees and walkways that take you to restaurants, shopping and galleries. Dining options in Central Park include Royal Caribbean’s famous Chops Grille. For guest that enjoy the view, there are inward facing rooms that overlook Central Park so you can take in the gardens anytime day or night. 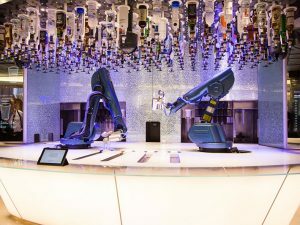 The lively Royal Promenade is the perfect place for a drink from a robotic bartender, shopping, restaurants and more! It’s all fun and games at the Boardwalk! A nostalgic feel with a handcrafted carousel and arcade makes you feel like a kid again. Then you can relax at the AquaTheater where you will see a high dive show with the deepest pool at sea. Cruising is not all about relaxing. There’s also fun and thrills! Pool & Sports Zone. After you encounter the “Perfect Storm” of water slides, you can take a plunge down a 10-story slide that ends on the Promenade deck. 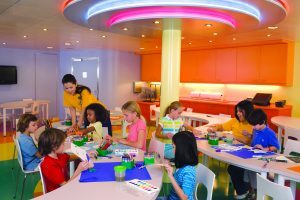 You can also learn to surf on the exclusive “FlowRider”, climb a rock wall and zip line across the ship. 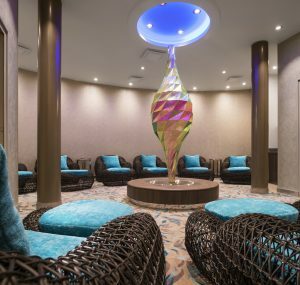 After all that excitement, you may need to relax in the Vitality Spa and Fitness neighborhood. Aromatherapy and full body wellness help you to recharge your body, mind and spirit. This is the place for music, laughs and Broadway hit moments. 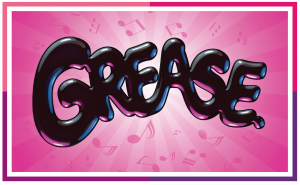 On board you will be able to enjoy the Broadway musical “Grease” as well as exclusive shows like “Columbus, The Musical”. You will also find Vegas-style casino action with poker, blackjack, slots and roulette. 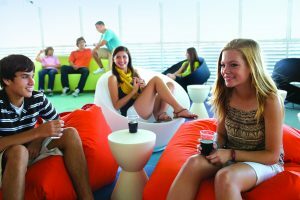 Harmony of the Seas wants everyone to have their “space”. Teens, kids and babies, too, can hang out in their own area that designed just for them. 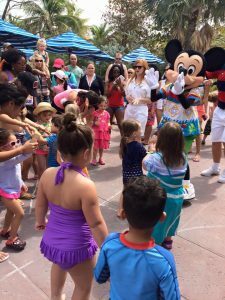 Grouped by age and supervised by trained, certified staff, there’s also fun going on that is sure to bring smiles to every age! 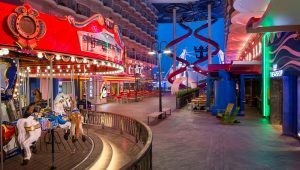 For more information about the neighborhoods on Harmony of the Seas or about any Royal Caribbean Cruise Line ship, contact your favorite DWB Vacations team member! By giving my children experiences I have seriously cut down on the clutter in my house. My children now have toys that they actually play with and enjoy. Plus since there aren’t so many (there are still a ton) they are able to play more freely and without having to yell “mom I can’t find my (insert random toy here)”! I also have found that my children now play longer without coming to find me. It seems that since they have less they aren’t as overwhelmed and they are really able to enjoy their stuff! Let’s just be honest. That toy little Johnny just has to have or he will die, we all know if we are lucky he will play with it for a couple of weeks and then it will join the bin of forgotten toys. I remember for Christmas I bought my son a $50 Paw Patrol truck. By Easter he told me he was done with it and I could hand it down to his cousin! Seriously! But with an experience you are giving your child something that they will be able to enjoy and build awesome memories from. That’s something that a piece of plastic will never give you. Again let’s be honest, as parents most of us spend way too much money on our children. We go into debt giving them piles of gifts so we can post on social media how beautiful our trees are and what a great celebration our children have. So why not spend that money on a vacation? I’ve had clients tell me that a Disney trip costs too much, but once I point out how much they spent on birthdays and Christmas they realize its usually the same (or cheaper). Still there are the hold outs that say “but my child enjoys opening gifts, I can’t just give them a piece of paper”. To this I say get creative. If you want to give them things to open then give them items they will use on their trip! When your child is all grown up and they start to have little ones of their own ( I know, scary thought) are they really going to remember that beloved item that they just had to have? The chances are pretty slim. 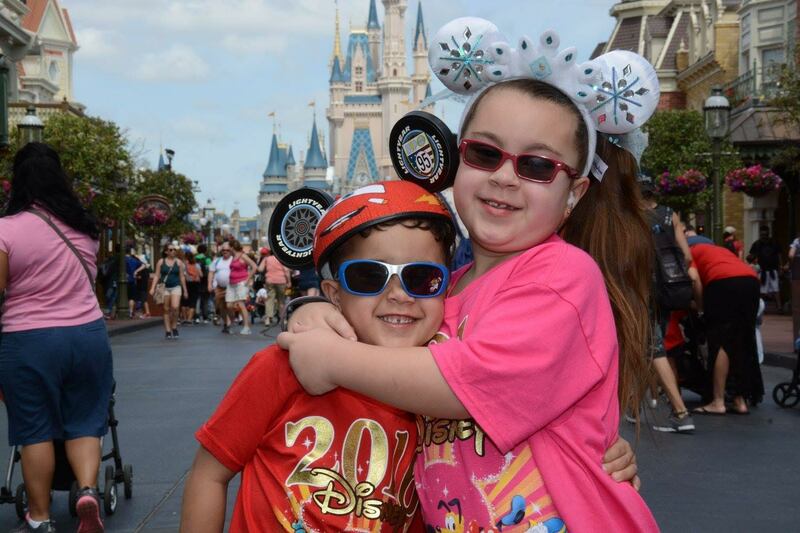 But chances are they will remember that awesome trip to Universal Studios, or that Disney cruise or that year long season pass to Bush Gardens. They will remember the time they spent with their parents, their siblings, and their extended family. They will remember the laughs, the inside jokes that come from experiences and even all the mishaps that eventually become treasured memories, for the rest of their lives. What’s better is they will relive these memories with their siblings for years to come and will often reenact them with their children. And with it your children’s childhoods. Before you know it they will be grown up and (hopefully) out of your house. 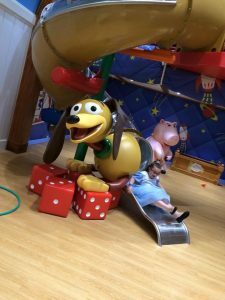 The days of tripping over toys will be gone, but so will the days to take their pictures with a favorite character, or snuggle close with them during that firework show. My eight year old today told me the Disney princess were fiction, but she would still pretend they were real the next time we go to Disney. I swear it was a punch to my gut. I can only hope that on our next trip the magic returns for her. But that’s how quickly it can happen. One day our children are these bubbly wide eyed beings amazed by everything around them, and the next they are starting to look at life with a critical eye. So what are you going to do with the time you have left with them in the wonder and amazement phase? Are you going to waste that moment on pieces of plastic that will be forgotten, or are you going to spend it making memories that will last both of you the rest of your lives? 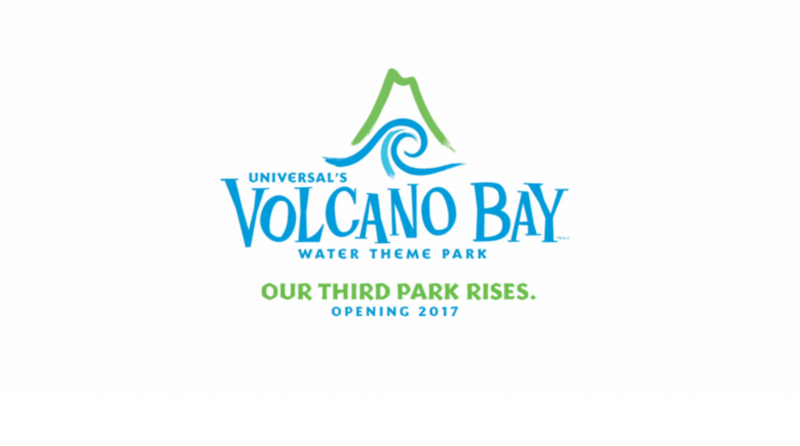 We are very excited to share a first look into Universal’s Volcano Bay coming to Orlando in 2017! Universal Orlando Resort will be opening their third park in the Orlando area. Universal Orlando Resort tells us there will be no standing in long lines, no wrestling with tubes and no waiting for the fun to begin. It will be a tropical paradise just steps away from everything Universal Orlando Resort™ has to offer. Where will it be on Universal Orlando Resort’s property? Universal’s Volcano Bay will be conveniently located at Universal Orlando Resort next to Cabana Bay. The new Universal Orlando theme park will be within walking distance of some of the most amazing resort hotels in the Orlando area! To find out more about Universal Orlando Resort or to book your next vacation, contact your favorite DWB Vacations team member today! For about 4,000 years sailing vessels have named a Godmother to launch the ship and bless its journey and passengers. In recent years the cruise lines have taken to making celebrities the Godmother of new ships. Sometimes there is a natural tie in between the celebrity and the ship as when Jennifer Hudson was named the Godmother of the Disney Dream in 2011. Hudson formerly worked at Disney World before her American Idol days. Today, in a step away from the traditional Godmother, Norwegian Cruise Line named Armando Christian Perez to be the GodFATHER of the new Norwegian Escape. If that name doesn’t ring a bell, it is because you probably know him as Pitbull, the miami based singer famous for hits like “Feel This Moment” with Christina Aguilera and “Everything Tonight” with Ne-Yo. The choice makes sense for many reasons. First, it represents Norwegian Cruise’s less than traditional cruising style. In the announcement, Norwegian Cruise Line said, “”reinforces Norwegian’s nontraditional cruising that focuses on freedom and flexibility for guests.” Norwegian Cruise Line is known for their “freestyle” cruising that gives guests the freedom to choose. Guests can dress up or down or they can dine in a different restaurant every night. So it only makes sense that this honorary position should be just as nontraditional as the cruise line’s style. Second, Pitbull has already been a partner with Norwegian Cruise Line The artist performed at the inauguration of the Norwegian Getaway in 2014 and for the Nov 9 pier side inauguration of the Escape he will perform again. Currently being built at Meyer Werft in Germany, Norwegian Escape will sail weekly seven-day cruises from her year-round homeport of Miami to the Eastern Caribbean beginning on November 14, 2015. The 164,600 gross ton ship will be the largest ever to home port year-round in Miami, carrying 4,200 guests to tropical Caribbean destinations including St. Thomas, U.S. Virgin Islands; Tortola, British Virgin Islands; and Nassau, Bahamas. Norwegian Escape’s signature hull artwork is designed by marine wildlife artist and champion of ocean conservation, Guy Harvey. Have you ever wanted to visit Key West? It’s a great vacation spot that you can get to by land or by sea! Many of the cruise line have a stop on the island during their Bahamas and Caribbean sailings. Whether you are visiting for a day or a long weekend there is plenty to do on the island. Here are a few of my top must dos! Take a ride on the conch tour train – you will get a nice overview and history of the island from your trolley. The guides are very knowledgeable and you will see attractions you would like to go back to and explore more! 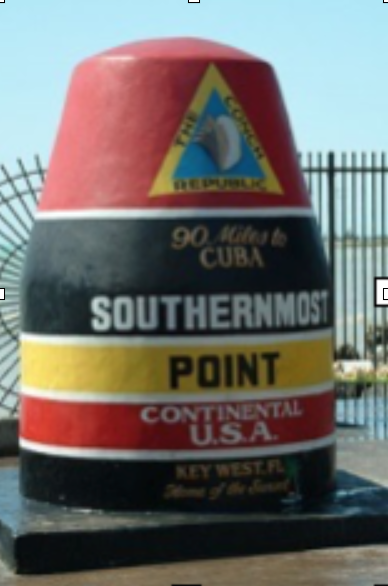 Take a family picture at the Southern Most point of the continental US, its only 90 miles to Cuba! Tour Hemingway’s House – Take a guided tour of the house and see the famous 6 toed cats. Do some shopping in Mallory square, visit the Key West Aquarium, the Shipwreck Treasure Museum during the day and take in the sunset and street vendors at night. You will see everything from acrobatic cats to fire breathers as the sun goes down over the ocean! View up to 60 different Buttery species and over 20 exotic bird species at the Key West Butterfly and Nature Conservatory. 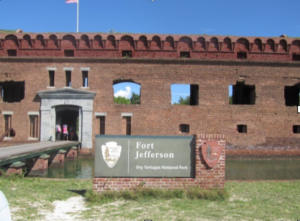 Take a day trip out to the Dry Tortugas National Park. If you are in town for a few days take the ferry that departs every morning for a day of exploring and snorkeling the beautiful waters. A sea plane is also available for shorter trips. Of course no trip to Key West is complete without doing the Duval Crawl! Start at Hogs Breath on the North End and work your way down. Make sure you stop at Sloppy Joe’s for some great local music, see where Hemingway used to hang out at Capt. Tony’s Saloon, and have a margarita at Jimmy Buffett’s Margaritaville. No matter what you decide to do Key West is a diverse and entertaining destination! 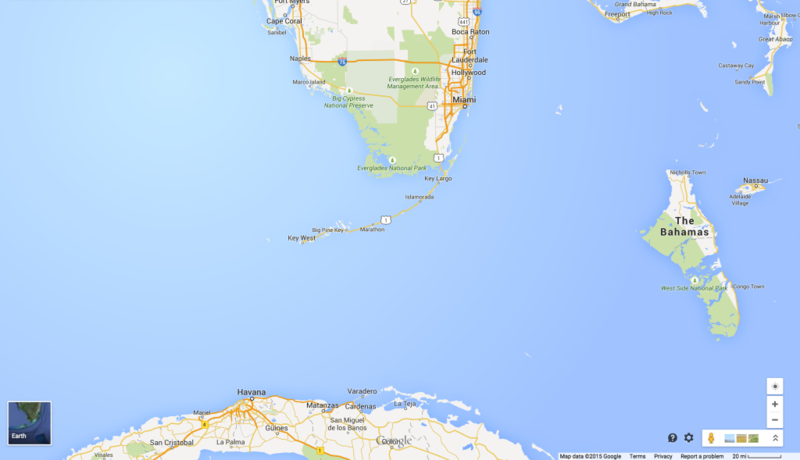 You’ll notice Key West is the last key in Florida. Key West is actually farther south than Nassau and only 90 miles from Cuba. Adventures By Disney is adding river cruising to their list of exciting adventures! Sailing wi th AmaWaterways, the travel industry’s premier luxury river cruise line, Adventures by Disney river cruises offer a new way for you to experience the heart of Europe in a way that is active, immersive and easy. In 2016, Adventures by Disney will offer sailings along the Danube River, allowing your Clients to explore the iconic locations and hidden gems in eight destinations across four countries – Germany, Austria, Slovakia and Hungary. These 8-day/7-night active departures will take your Clients off the beaten path in search of the culture, art and unique stories intrinsic to each European city and town visited. From medieval activities at Devin castle in Bratislava and a walk along the tree tops in Kopfing to a visit of locations filmed in “The Sound of Music” in Salzburg and biking in every port, the opportunities for exploration are endless! These exclusive Adventures by Disney sailings will take place July 7-14, July 14-21, July 21-28 and July 28 – Aug. 4, 2016. A special holiday themed sailing, departing Dec. 22, 2016, will also include visits to the renowned Christmas markets in Budapest and Vienna, a Vienna Boys Choir Christmas performance in the Hofburg Palace Chapel and a special holiday menu lunch. 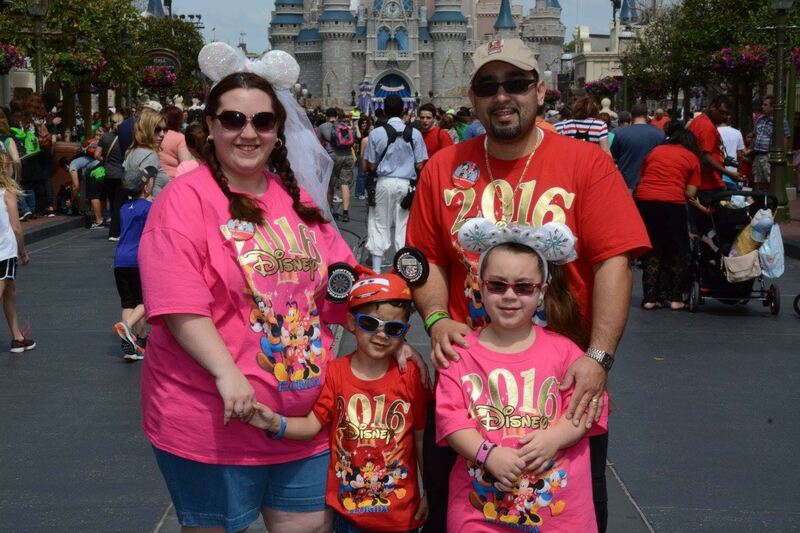 Adventures by Disney is family friendly but there are minimum age requirements and recommended ages for any of their adventures. 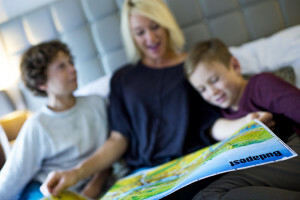 For the river cruise itinerary, the minimum age is 4 years old, but Adventures by Disney recommends the experience would be best for children ages 8 and older. For more information or to book this adventure, please contact us today! Norwegian Cruise Line is serving more than Breakfast at The Supper Club. Spend an evening with a Brain an Athlete, a Princess, a Criminal and a Basketcase at For The Record: Dear John Hughes. This unique 360-degree post-modern cabaret brings the movies to life through their original soundtracks. Immerse yourself in the glorious 1980’s at this feast for the senses. “Twist and Shout” with Ferris, “Try A Little Tenderness” with Ducky and let Jake Ryan light your “Sixteen Candles.” No leg warmers required. Along with this fun production, you will be able to enjoy new and unique dining experiences like Jimmy Buffet’s Margaritaville at Sea, The Cellars (A Michael Mondavi Wine Bar) and more! There will be a bar called “The 5 O’Clock Somewhere Bar” as well as “Carlos’s Bake Shop” straight from the streets of Hoboken. Younger cruisers will enjoy Teenage Mutant Turtles mini golf and everyone will enjoy lots of water fun in the Aqua Park with 4 multi-story slides. The adventurous cruiser can climb on a 3 story ropes cruise while the tired cruisers can relax in the Mandara Spa. Contact your favorite DWB Vacations agent to book your ESCAPE! 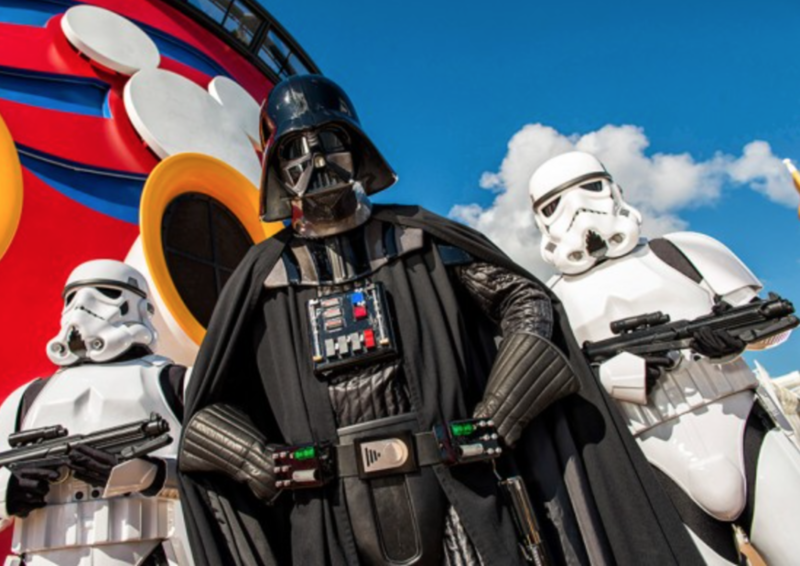 Disney Cruise Line is introducing Star Wars Day at Sea on eight Disney Fantasy sailings this spring! Star Wars Day at Sea will be on Disney Fantasy cruises sailing on January 9, 23; February 6, 20; March 5, 19; April 2 and 16, 2016. 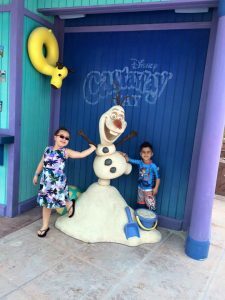 Departing from Port Canaveral, the seven-night Western Caribbean itinerary includes Cozumel, Mexico; Grand Cayman, Cayman Islands and our private island in the Bahamas, Castaway Cay. For more information, check out the Disney Parks Blog! A tale of 2 travelers with a flight delay…or which brother actually spent more? DWB VACATIONS, LLC is registered with the State of Florida as a Seller of Travel. Registration No. ST39234. Registered California Seller of Travel (CST) Registration number 2117630-70.